Roads everywhere are replete with radar speed signs warning drivers to slow down. If you want to buy one, you’ll find google just as full of them. So why choose Traffic Logix? 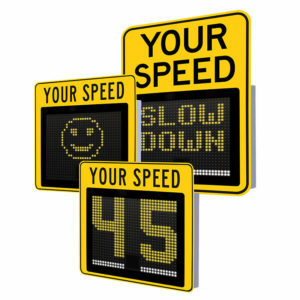 Here are some surprising facts you may not know about our company and our SafePace line of speed display signs. Our signs offer unique features you won’t find anywhere else. We make the only radar signs offering scrolling text for increased engagement, the only signs that can display text and digits on the same sign, and the only rotating variable message sign in the world. 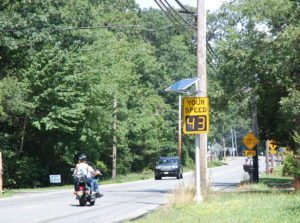 We offer a variety of power options for your signs including AC, battery, and solar power. Our signs are the only ones that can function for up to 3 weeks autonomously on battery power- no one else can even offer half of that. We’re one of only two companies that offers web-enabled signs so that you can manage your signs remotely, adjust settings and parameters, and download valuable traffic data at the click of a button. We know how important remote access is, so we made our cloud option a lot more affordable than you’ll find elsewhere. We even included one year free with every SafePace Evolution sign purchase. All SafePace signs are designed and manufactured right in our own warehouses so we know every detail of our sign structure and can correct any potential issues quickly and easily. Our signs can be used with the Guardian speed camera accessory to capture images of speeders and warn them to slow down. At Traffic Logix, we’re pretty proud of how uniquely our speed signs address the dynamic needs of safer, more livable streets. It’s why our lineup and options keep growing, and why our signs are the choice of hundreds of cities around the world. PreviousPrevious post:Is Your Safety Plan Driven by Data?NextNext post:Can It Be Easier to Enforce Speed Limits? I am interested in speaking with either your company President or the Director of Operations. Will you please have someone contact me at their earliest convenience.